Can we talk about staging children’s bedrooms? I recently received an email from Sarah asking for advice in this department. I wrote about staging when you have children on this blog and in my $4.99 home staging eBook, but I want to emphasize some points about staging kids’ bedrooms. When your home is for sale and you have children living there, you’re forced to walk a delicate balance between maintaining a consistent home environment for your little ones and keeping the home irresistibly show-ready for a variety of demographic buyers. Gee, talk about a challenge! Don’t hate me for asking for the impossible. I’m a mom and grandmother and I know what little people need, and how their spaces can look. Yeah, disaster areas. So, please remember, I’m offering advice, I'm not casting rules in stone. Your family comes first … and usually the budget a close second. Home staging and parenting share a common denominator: We do the best we can and that is good enough! Your home has just so much square footage. Every buyer wants space. The more usable space your home appears to have, the more valuable it looks to a buyer. Your goal, just as in every other room, is to make as many buyers as practical envision themselves comfortably, effortlessly living in your home and using every available square foot. Buyers will know actual square footage from your listing, and an appraisal and asking price will be based on price per square footage. Still, buyers are impressed with the appearance of spaciousness. You know where I’m going with this. Make your rooms look roomy and generic. Not dull, not boring … just not so specific in function or decor that buyers write off the space. 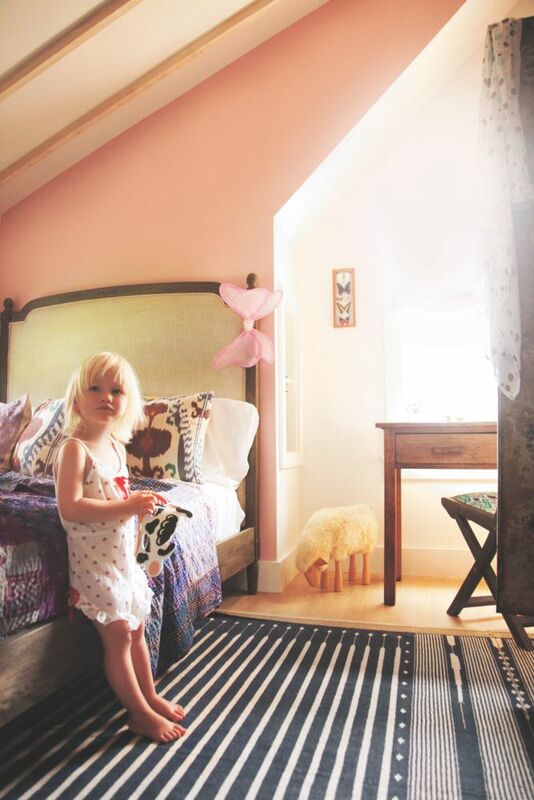 Here are my best tips for staging children's rooms, based on the most common mistakes parents make when selling a home where kids live. and providing places to stash stuff. 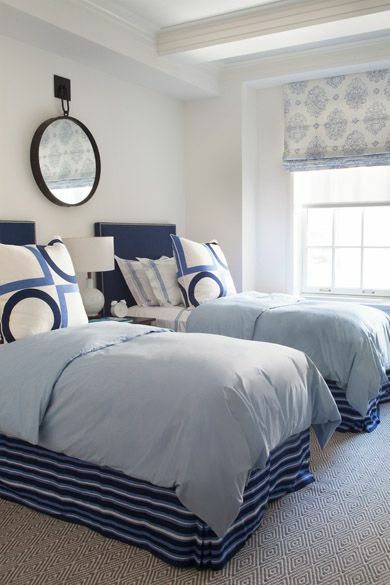 Photo: Sawyer Berson via Decorpad. Skip Customized Cabinetry. Don’t create built-ins that limit the use of the floor’s square footage the way bunk beds, cubbies, and custom play areas like cars or castles would. A trundle bed, sleeper sofa, or convertible day bed is a good alternative if you need to sleep two. Once again, we do the best we can, given our lifestyle and budget. I realize you're not going to rip out built-in shelving and play tables, and that's rational. But if you've just spent $200 on two sets of Disney bedspreads, blankets, and sheets, you could pack them away for now and replace them with bedding that doesn't shout, "Look at Me!" A realtor once told me that bunk beds were a sign to buyers that the home was short of space. Food for thought. Eliminate Girly or Oh, Boy! Don’t decorate exclusively to one gender. Not all pink ruffles but not all camo either. You’ve staged your other rooms to appeal to the masses so repeat the formula here. Go with a wall color that flows with the rest of your home. Make it easy for the buyer to envision this room as an office, craft room, or a bedroom for anyone regardless of gender or age. grown-up will encourage grown-up behavior. Photo: Phillip House NYC via Decorpad. You almost have to think politically correct! Consider Safety First. Creeps are everywhere. Don’t announce your children’s names on signs, pillows, and toys. I cringe when I see children wearing clothing or carrying backpacks with their name for all to read, making it easy for a child predator to use the "I know you" trick. Never forget that strangers will be touring your home. They know where you live. Don't give them your children's names. DeClutter. Again. Not knowing how long your home will be on the market complicates the issue of where to store toys, books, sports equipment, mementos, awards, and other childhood paraphernalia. You can usually find storage areas in your home where you can rotate out some cartons of toys and clothing. It‘s impossible for very young children to understand why toys and clothes need to be put away regularly. Storage like low chests and large, lidded baskets will look attractive and make daily pickups go more smoothly. Your outdoors areas should be as tidy as the indoor areas. That means no collection of old wagons and strollers, no play equipment that doesn't get used but is still stored in the garage or attic. A playroom is a playroom and can be staged as one, as long as it can be visualized as having another function -- game room, family room or bonus room. Never give up a bedroom. Bedrooms translate as money. If your playroom is a bedroom, make sure there is a bed in there. Look for what families need that overlaps with what everyone needs – things like plenty of storage space, comfortable congregating areas, areas for privacy, and easy home maintenance features. Emphasize these qualities with your staging and in your listing. Are there special features in your town or neighborhood that make it attractive to families? Attractions like exceptional schools, parks, hiking trails, swimming pools, summer programs, museums, and sports programs can be listed on your sales literature. There's plenty of hidden storage in this nursery. Of course, if you decide that the target market for your home is families, you can still stage it to balance your family’s lifestyle with the demands of staging to sell. Incidentally, I never recommend deciding who your target market is because I think it minimizes chances you will appeal to those outside your market. Whichever way you decide to go, contain as best you can children’s essentials to limited areas where they make staging-sense. By this I mean no bins of toy boats and rubber ducks in the bath, no gallery wall of finger-painted works of art in the kitchen, and no parade of strollers, wagons and scooters in the front entryway. If you look at the Pinterest Board for children’s rooms that Barb Schwartz, home staging’s pioneer, created, it shows everything I am telling you not to do. Yes, I said that! I’d be curious to hear comments from readers what their opinions and problems are regarding staging kids’ rooms. Since I’ve permanently turned off my blog’s comments section to thwart hackers and spammers, you can comment on my home staging Facebook group page.